Swift & Son 81 Tottenham Court Rd London W.C. 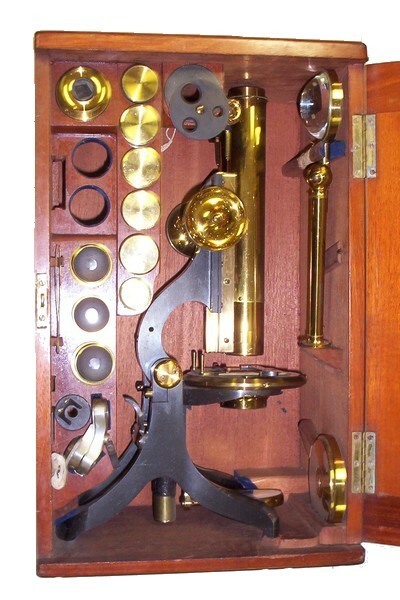 This Swift & Son microscope came supplied with a matched pair of eyepieces, an additional eyepiece, five objectives with canisters, a sub-stage polarizer, a Nicol analyzer that fits above the objective, a camera ludica, a double objective changer, a hand forceps, a sub-stage aperture wheel, and a free-standing bullseye condenser. The stage has a glass surface with a push-around slide carrier. 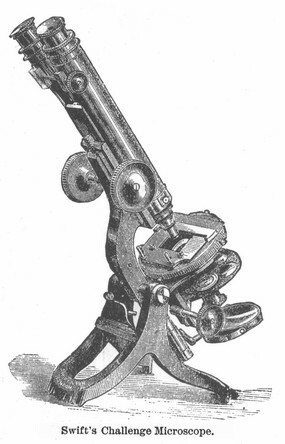 Swift's Challenge Microscope. - The instrument constructed under this designation by Messrs. Swift, is one of which it may be fairly said that it is surpassed by no other of its price in the excellence of its workmanship, and its suitability to the general wants of the Microscopist. The support on which it is hung is extremely firm and substantial without being heavy; and when the limb is brought to the horizontal position, resting on the cross plate between the two uprights, the instrument is still well balanced. The rack and pinion movement is made with oblique teeth; a construction which favors smoothness and sensitiveness in the adjustment, so that a l-4th inch objective may be focused by it alone. The fine adjustment is made by the milled-head at the lower end of the body. 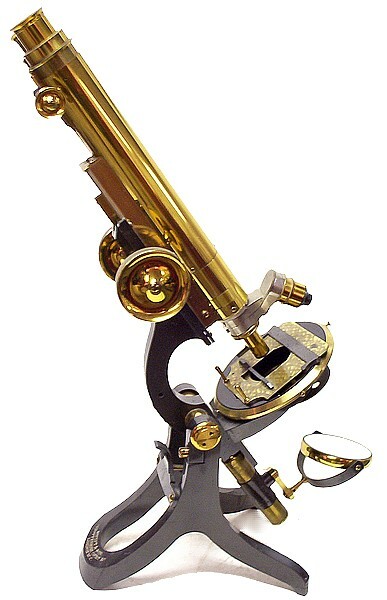 - It is a peculiarity in this instrument, which especially fits it for those who work much with Polarized light, that the analyzing prism is fitted into the body above the Wenham prism, in such a manner that, when its fitting is drawn out (without being removed), it is completely out of the way of the light-rays; whilst, when the use of the Polariscope is required, the prism can be at once pushed into the body, working in conjunction with the Wenham prism. This mode of mounting the analyzer is found to interfere much less with the definition of the objective, than the insertion of it between the objective and the Wenham prism. The stage rotates in the optic axis; and may either bear (as in the figure) a sliding object-carrier, or may be furnished with mechanical actions. The mirror is attached to the stem by a crank-arm, allowing it to be so placed as to reflect light of considerable obliquity. Beneath the Stage is a broad horizontal dovetail groove, into which is very exactly fitted a firm (sprung) slide that carries a Sub-stage for illuminating apparatus, fitted with a vertical rack movement, and with horizontal centering screws; this arrangement (devised by Mr. Swift) enables the Sub-stage to be placed in position or removed, without disturbing either the stage or mirror. The extremely ingenious Universal Sub-stage combining Achromatic condenser, Black-ground Illuminator, and Polarizer with varied adaptations-devised by Mr. Swift for this microscope, but capable of being applied to any other, will be described hereafter. 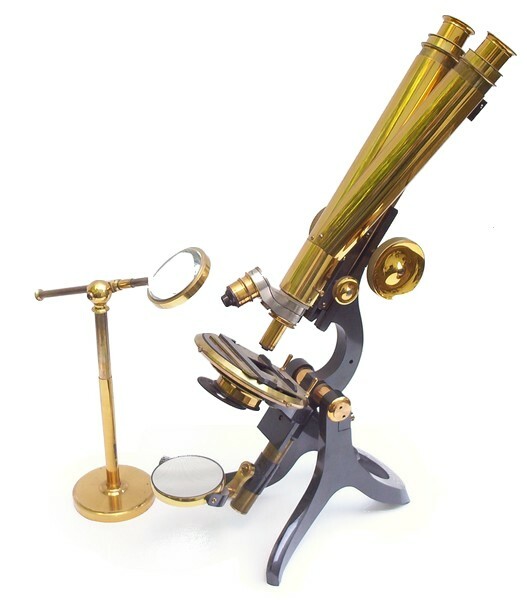 The price of this instrument, with Mechanical rotating Stage, two pairs of Eve-pieces, two Objectives (either a 2-inch of 12°, or a 1-inch of 18°, with a l/4th of 95° ) , Side-Condenser on Stand, and Polarizing apparatus in Cabinet, is 19 pounds. Accessories of various kinds can be readily fitted to it. - A ' first-class ' Binocular is also constructed by the same Maker on the Jackson model. 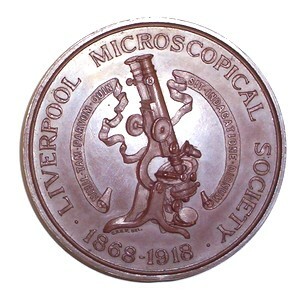 A bronze medal issued by the Liverpool Microscopical Society celebrating their semicentennial. 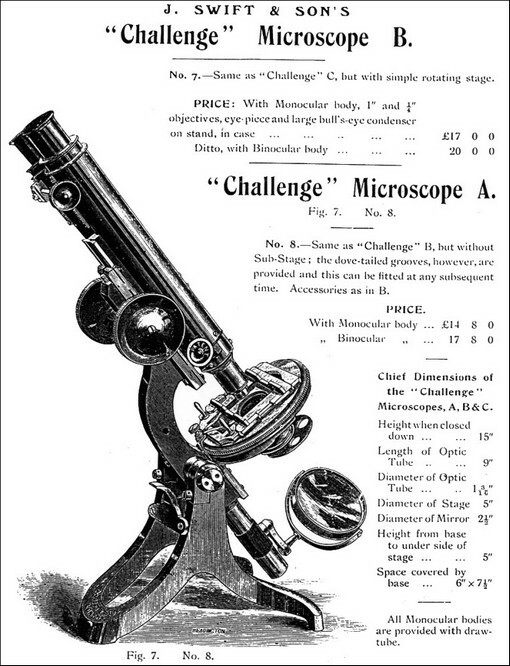 It shows a Swift Challenge microscope on the obverse. A brass plaque on the top of the storage case bears the original owner's name: William Matthew Wilson.